Note: this schedule is provisional. There are classes on the dates listed; the topics described will be covered; but the ordering and allocation to dates may change. "Discovering Computers 2011", Chapters 1 and 4 (skim is ok), and Appendix C.
"D is for Digital", Chapters 1 through 3. The Wikipedia article on digital audio, and, if you want to go further, this longer article by Christopher Dobrian. This tutorial on binary numbers. Optionally, the Wikipedia article on logic gates. 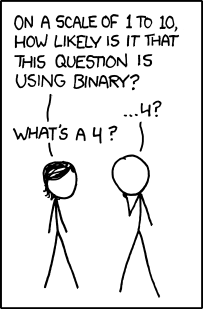 A few examples of binary-based geek humor. The Wikipedia article on Moore's law. The Wikipedia page on IP addresses. The original 1981 standard for the Internet protocol (Section 3 can be skimmed). The Wikipedia page on the protocol stack. Either the Wikipedia page on the Domain Name System, or (for a more technical look) the DNS Concepts chapter of "Pro DNS and BIND". This introduction to the HTTP protocol. The Wikipedia articles on the client-server model and cloud computing. The Wikipedia page on structured documents. Work through the w3schools HTML tutorial as far as `HTML Lists'. If you're already comfortable with HTML, then read the w3 schools list of the differences between HTML and XHTML. Read the help page on loading web pages to your TerpConnect account and check that you can transfer files successfully; you'll need this for homework, and it's best to be aware of problems in advance. Read w3.org's introduction to web accessibility, and skim through the web content accessibility guidelines (version 2). Work through the w3schools tutorial on CSS at least to the end of "CSS Styling", and (if you have time) to the end of "CSS Box Model". Browse some of the CSS-based designs at CSS Zen Garden. The Wikipedia page on databases (a long one! get an overview; don't try to memorize details). The Wikipedia page on the relational model. The Wikipedia page on entity-relationship models. W3.org's XML in ten points. An example of representing a relational database in XML. Work through the w3schools tutorial on SQL; complete the SQL Basic section and do the SQL Demo. Also do the of the SQL Advanced tutorial starting with SQL Create Table and going as far as SQL Create Index". Have a look at this video tutorial to phpMyAdmin basics. Don't worry if there are parts of this you don't understand. This article on common database architectures. The Wikipedia article on multi-tier architectures. "Discovering Computers 2011", Chapter 13. "D is for Digital", Chapters 5 and 7. The w3 schools DOM tutorial, including a sample of half a dozen of the DOM examples. The simple PHP tutorial from the PHP manual. This introduction to AJAX (intro only). 9 Apr 3 Content management system, blogs, and wikis When reading about these software systems, consider the question of server side versus client side, and what server-side resources might be necessary. The Wikipedia edit history page for the article on Barack Obama. Compare Wikipedia's article on the Encyclopaedia Britannica (particularly "Critical and Popular Assessments") with the Encyclopaedia Britannica's article on Wikipedia. The (in)famous Nature article comparing the reliability of Wikipedia and the Encyclopaedia Britannica. If you have time, I'd strongly recommend reading the detailed experiment description, too. Guadango et al., Who blogs? (Computers in Human Behavior, 2008). The Wikipedia articles on vector and raster graphics (again, make sure you understand the distinction). The Wikipedia article on scalable vector graphics (SVG). The Wikipedia articles on lossless and lossy data compression (make sure you understand the distinction). The Wikipedia article on digital audio. The Wikipedia article on video compression picture types. Joe Kleinberg and Steve Lawrence, The structure of the Web, Science, Volume 294 (30 Nov., 2001). Lawrence Page, Sergey Brin, Motwani Rajeev, and Terry Winograd, The PageRank Citation Ranking: Bringing Order to the Web, Technical Report, Stanford InfoLab, 1999. Christopher D. Manning, Prabhakar Raghavan, and Hinrich Schütze, Introduction to Information Retrieval, CUP, 2008; Chapter 5, Scoring, term weighting and the vector space model. Fred Brooks, The Mythical Man-Month, Chapter 2. Eric Raymond, The Cathedral and the Bazaar, The Social Context of Open-Source Software. Antonio Lupetti, Structured process you must know to develop a web application. Wikipedia article on Cloud Computing.